... Have you seen E? I shall have to give up this place out of pure disgust at the conduct of Seymour I expect. The actual phases of extensions at the west end have resulted in a somewhat awkward-looking, and structurally unsound development. “We crossed in a rowing boat. It was a still November evening. One dark heron flew over the Solent backed by a daffodil sky. 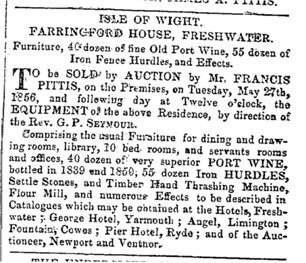 In 1856, George Turner Seymour finally sold Farringford to Tennyson, along with a sizeable estate called Priors Freshwater (see Priors Freshwater), for £4,350 – equivalent to just over £400,000 today. The sale documents still refer to the house as “Farringford Hill”. The process was infuriatingly protracted for Alfred, as Seymour wanted to remove all his furniture for auction before the Tennysons could install their own, and redecoration was also required. The first problem the family encountered was the poor state of the drains, and by July 1856 Emily was describing them as “bad as they have never been before”(Journal, July 1856). Consequently, in November and December of that year, the first major work carried out by the Tennysons involved extensive work on the drains at Farringford. In May 1859, bay windows – Emily Tennyson calls them “oriel windows” – were put in to the attic rooms, thus converting them from low-ceilinged, dark rooms into the much lighter, open rooms of today. In 1863, while Tennyson was travelling in Yorkshire, Emily supervised further alterations to the house; what these were exactly is unknown. In 1864, during another of Tennyson’s absences, Emily set to work having “the back staircase altered and a grand arch made”(Journal, 27 June 1864). This may refer to one of the arches in the hall because in July she writes, “I am very glad that he likes the alterations I have made in the hall”(Journal, July 1864). It is relevant to note that the internal arches at Freshwater Court – a house built by well-known local builder Kennett, who also built the new library at Farringford in 1871 – are smaller versions of those at Farringford, suggesting that Kennett also constructed these. In 1868, during Alfred’s visit to Portugal, Emily again supervised the insertion of a small dormer window (still extant) into the west wall of Tennyson’s attic study. According to Tennyson’s friend William Allingham, the poet had wanted the window for sixteen years. It provides views in a westerly direction towards Moon’s Hill and the Downs above The Needles. In 1871, it was decided to build a new study or library to contain Tennyson’s overflowing book collection. Like the main body of the house, it is built using a yellow brick in Flemish bond. To obtain a view to the north, large windows were inserted in the north wall, but to allow an uninterrupted vista a central section of the roof of the south servant’s wing opposite had to be cut away and a flat roof built instead. Although the original roof of the north wing was replaced by the present second storey, it too presumably would have required the same alteration. The library was heated by a large fireplace, still extant. At a later date, secondary double glazing was fitted and central heating arrived in the form of a pair of pipes that encircled the whole room at skirting board level. dormer window: A window that projects vertically from a sloping roof. Flemish bond: Brickwork in which ‘header’ bricks (bricks with their width exposed) are separated by one ‘stretcher’ brick (bricks with their long narrow side exposed), in an alternate pattern.